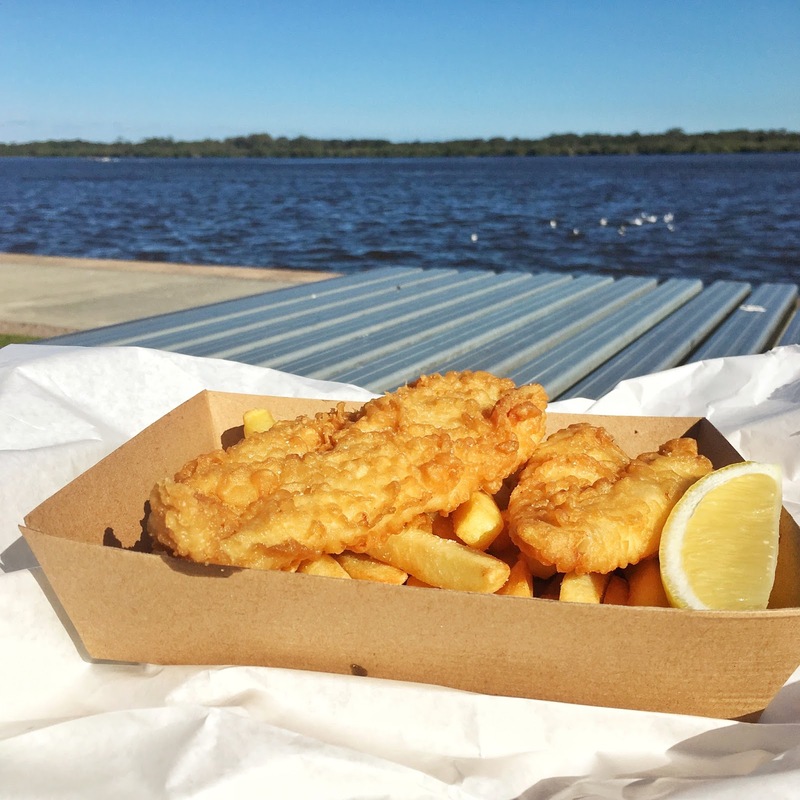 As I’ve stated in previous posts, Ballina is a place of fond childhood memories for me. From the time I was five years old, every summer of my childhood, and many other holiday periods, were spent here. We stayed with my Nan and Pop who lived in a two-storey house in East Ballina, the headquarters of Ballina Taxis until they retired. We would drive to the beach every morning, back in time for morning tea at 11am, sometimes returning to the beach in the afternoon, but back for afternoon tea at 4pm and beer (for the adults) at 6pm. Dinner was served at 7pm. My cousins from the Gold Coast (later Brisbane) would also often be there. Beach, cricket in the driveway and games of cops and robbers are prominent in my memory. My cousins had greater knowledge of pop music than us country bumpkins, and introduced us to such classics as ‘Rack off Normie’ which we played ad nauseam. We once rewrote the lyrics of Ray Parker Jnr’s ‘Ghostbusters’ song to be ‘Toothbrushes’ which would have made a fortune as an advertisement jingle, if only we had sent it to an agency. My husband, John, flew up to Ballina this morning to join me for the last two days of this visit. Instead of taking him for a walk down memory lane, we cycled it. We first rode to Missingham Bridge and then up North Creek to the RSL nursing home where my pop spent his last days (he passed away 12 August 2009). He was so deaf and blind with a touch of dementia, he didn’t know much about reality in the end. He probably wasn’t aware he was in a nursing home, let alone that it had a beautiful outlook across the creek. I only visited him there once and it was not a cheery place. Today there were many residents sitting out front, looking dazed, perhaps confused by the chill in the air. One family was pushing a man in his wheelchair outside the childproof gated fence, along the path which we rode. Other than the nursing home there was a festive mood in the air. It was the first day of the public school holidays, balloons in parks signified parties and a band was playing as part of NAIDOC Week’s ‘Yardabalair’ Music Event at Missingham Park Amphitheatre. 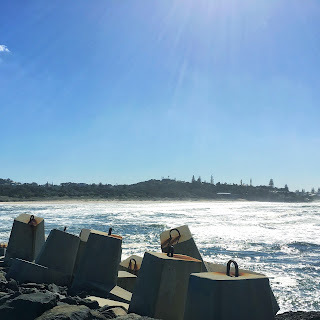 We rode across Missingham Bridge, which I still think of as new, to Shaws Bay, the place to go with children or when the surf is too rough elsewhere. It looks smaller than I remember and the wall between grass and sand shorter, possibly due to the build-up of sand over time. The caravan park is still there but I’m sure it used to continue to the water’s edge; now the combined walk and cycle path take priority for the view. Nan and Pop had three children and eleven grandchildren. The eldest child, Gail, died of leukaemia in Brisbane, far too early, just before Christmas in 1991. That was one of the toughest days in my life but one which I also remember for important people coming to the fore (thinking of you, Brad, and Uncle Mike, thanks for the double Johnny Walker Black at the airport, I needed it). It was hard for Nan and Pop to have a child leave the world before they did, and they were just minutes short of reaching Brisbane in time to say goodbye. Of my cousins, I am closest to Jo(anne). With information flying around by phone on Gail’s last day, I felt I had to be the one that broke the news to Jo of her mother’s death in case someone else did so accidentally, assuming she already knew. Jo and I then took a flight from Sydney to Brisbane together and for many years afterwards I associated flights with repressing grief. In contrast to Gail’s death, we were ready for Pop to leave us, aged 94. I remember the night of Pop’s funeral spending what seemed like hours at the Shaws Bay Hotel talking to everyone but particularly one of my cousins I barely knew, Cameron, from my uncle’s first marriage. The time around Pop’s death is actually a little magical for me. Ten of the eleven grandchildren were around and only one brought a spouse, allowing cousins to bond unhindered. The bike path runs all the way along the breaker wall, the north side of the mouth of Richmond River, now not only consisting of large rocks but ugly concrete blocks. I stood out on the headland for some time with mists of breaking waves occasionally cooling my skin (my hands and neck are now sunburnt). I looked back at Shaws and was struck by the stark contrast of colours where river met sea and a pelican played. On the other side of the breaker was Lighthouse Beach. For many years, when I was young, it was simply called “the beach” and for people requiring greater clarification, “not Shelly Beach”, the beach further north. The dunes seem bigger and the foliage thicker than I remember but then it seems a lot of ecological protection has occurred since I was young. Last night I wrote a scene for my novel set on this dune but now I need to add a more accurate description as a result of this bike ride. My time of (reluctantly) teaching the geography of coastal erosion came to mind as I read the worn boards informing of dune care. Further research revealed the main driver of the ecological care for Lighthouse Beach passed away many years ago and nobody else has really picked up the baton since. The surf life-saving club at Lighthouse Beach is now a super-sized version of what it once was, including a trendy café with magnificent views over beach and water. The beach itself looked unkempt and unloved, perhaps because it’s winter, perhaps it’s no longer the favoured beach. 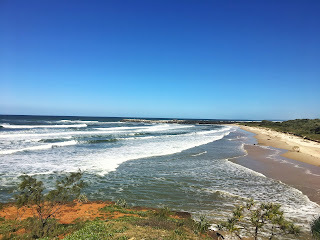 Out on the Ballina Head Lookout we checked the ocean for signs of migrating whales but not even a dolphin was sighted. 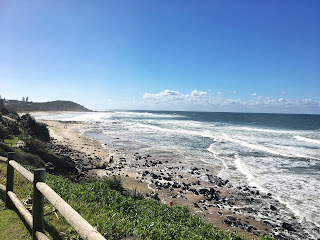 We took several photos of Lighthouse Beach and Shelly Beach around the other side and pushed aside the thought of riding up a very steep hill to visit Pop’s grave. On the return journey we went past the Ballina Beach Resort which we frequented when our children were young and Nan and Pop’s house was already quite occupied. At Christmas time, when I was a kid, we’d sometimes have more than a dozen people staying at the 3-4 bedroom house. Four of us young ones shared a bedroom and tried to stay awake so we could catch Santa Claus delivering our sacks of goodies but active beach days always made us too tired to succeed. Further into our ride, we inspected what was once a restaurant we held in high regard from our one visit. At the time our son, quite little then, talked about being a chef one day and we happened to mention this; the chef gave both our children a tour of the kitchen, to their great joy. Today it looked more like a dilapidated shack, contrasting with a brightly lycra'd yoga instructor completing her push-ups in the yard on the side. We returned to our hotel, the Ramada, where I’ve stayed for my few Ballina visits over the last ten years or so. I love looking out to the Richmond River. It brings me peace and happiness. Six years ago, my Nan moved to my parents’ place near Wagga Wagga and is still alive at the grand age of 101. 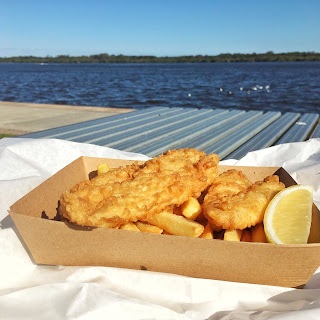 The last few times I’ve visited Ballina, I’ve fantasised about buying a small business, like a coffee shop, and enjoying the slower life Ballina has to offer. One day I may just act spontaneously on such a whim and my whole world will change. However, for now, I must be content with infrequent trips and my memories. 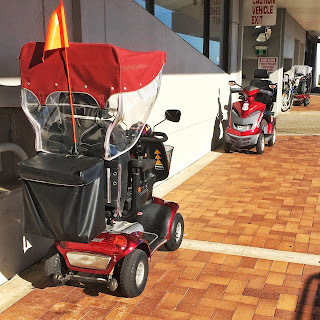 I've been constantly amused this visit by the number of motorised scooters around, seemingly all purchased from Ballina Mobility and Golf. They seem to go at two speeds, slow and careful, or at a fast whizz. I'm sure the bike track must have been constructed just as much for them as the bikes. Today we walked past the RSL to find a plethora of them parked outside. It gave me the giggles.